These solid brass AFW Ball Bearing Swivels and Snap Swivels with welded rings are a must for any serious angler who simply wants the best. The patented bullet shape provides fluid rotation and decreased water resistance and are engineered to survive the fiercest one-on-one battles. The unique gun metal black finish minimizes reflections and cloaks the tackle. 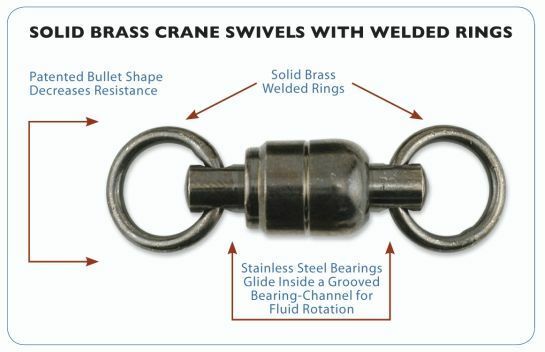 Swivels have a solid brass body, stainless steel bearings, and welded rings for maximum security and to endure the unforgiving offshore environment. The tournament snaps are tempered and made of solid brass, designed to stay closed and keep you connected to the fish. Don't even think about making a trip to the canyon, or to any locations that holds tackle busting fish, without these battle-tested ball bearing swivels in your tackle box. 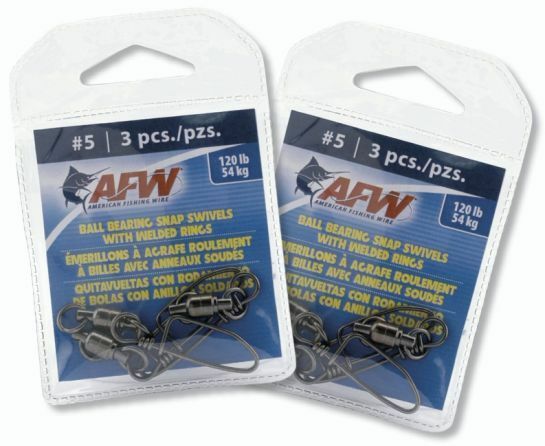 The AFW ball bearing swivels come in all sizes ranging from #2 rated at 65lb test to #10 at 660lb test. The ball bearing snap swivels are available from #2 rated at 44lb test to #10 at 450lb test. Packages consist of 1 to 5 pieces (depending on size) as well as bulk packs of 50. Prices vary. Shopping around for the holidays? How about a new conventional reel for that special angler in your life? Or maybe just for you?